These are the toughest tow slings on the market, and the easiest to use! Heavy duty all steel construction and reinforcements in critical areas have been included to make this product stand up to all of the rigors of every day usage. You can hook up to vehicles quickly and easily thanks to the low profile pivot design. The extended reach spacer arms are easy to adjust, and include one hand pull releases mounted on the inside of each arm. Carriage bolts connect the 10" wide x 45.5" long sling straps, facilitating quick replacement when needed. 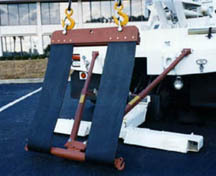 The standard duty car tow sling is rated for 3,500 lbs. lifting, and 7,500 lbs. towing, and is designed for use with any standard 1 ton tow truck.